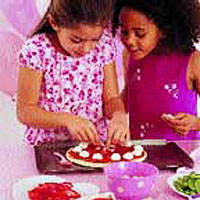 These pizzas are quick to cook, so they can be assembled when your little guests arrive. Prepare all the topping ingredients, place them in separate bowls, then get the children to help finish them. Preheat the oven to 220°C, gas mark 7. Remove and discard all the packaging from the pizza bases. Place them on 2 separate baking sheets. Spread 6 tablespoons of the chopped tomato mixture evenly over 1 base, allowing a 1cm border around the edge. Repeat for the remaining base. Arrange all the prepared vegetables over the pizzas, before scattering with the mini mozzarella balls. Season with pepper and drizzle with the olive oil. Cook for 10-12 minutes, until the cheese has melted and is golden in colour. Slice each pizza into 6 wedges. Make our vegetarian pizza as above, or vary the toppings: try chopped ham, chopped canned pineapple pieces, baby tomatoes and prawns. This recipe was first published in Tue Mar 01 00:00:00 GMT 2005.